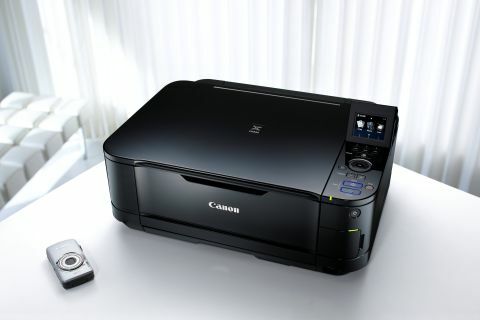 Though it's the least expensive of Canon's new generation of 'MG' all-in-one printers, the MG5150 still serves up a feast of features. Canon's typical dual paper-feed system is included, which combines a lower cassette and a rear tray, ideal for holding plain paper and photo media respectively. Great quality is assured for both document and photo printing thanks to Canon's latest ChromaLife100+ five-ink system that includes both pigment-based and dye-based black inks, along with dye-based cyan, magenta and yellow inks, all in separately replaceable cartridges. Ultra high-resolution 9600dpi printing is backed up by a 2400dpi scanner, enabling one-touch mono or colour photocopying. Quite compact for an all-in-one printer, the MG5150 weighs in at 7.8kg and measures 460 x 370 x 160mm (W x D x H), and it's impeccably turned out in piano black. Direct printing and photocopying in standalone mode, rather than from a connected computer, are taken care of by a particularly slick control system that combines a neat button layout with a four-way navigation pad and quick control wheel, while an intuitive menu system displays on the 6cm colour LCD. Neat direct printing tricks include the ability to print PDF documents and photos from a USB flash drive or various formats of memory card, including CF, SD, MMC and several types of Memory Stick. For photos, there are some smart additions on the menu for creating ID cards and calendar prints, as well as photo enhancements for red-eye correction, noise reduction, face brightening and a catch-all Auto Photo Fix II function. Switch to printing from your computer and there's also software included for creating photo prints from individual frames in HD movie clips captured on Canon cameras. Getting back to document printing, the inclusion of a pigment-based black ink makes for crisp text output that's of much better quality than with some of the more photo-oriented dye-only printers on the market, like the Epson PX650. The MG5150 also includes an auto duplex function for double-sided output. Print speeds are a little on the slow side for a Canon printer, and photo output takes about twice as long as with models like the iP4700 and MP640. In our tests, the MG5150 took 46 seconds to print a borderless 6 x 4-inch print in standard photo quality mode and exactly four minutes to output an A4 photo print at the highest quality setting. Mono text and mixed text and colour graphic DTP pages took eight seconds and 21 seconds respectively. Overall, the MG5150 creates very good quality output and the only things it's really missing are wireless connectivity and the ability to print onto white-faced CDs.